So what exactly is this book? It’s an abridged prayer book for women, with daily and Shabbat prayers, various prayers for daily life and the life-cycle, and a small selection of Psalms. 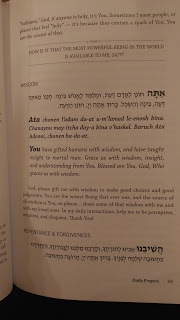 See how there are four parts to each prayer (or I should say most prayers)? There’s the original Hebrew, then the transliteration, then the translation, then finally, a modern-language conversation with God on the theme of the prayer. There are also instructions and explanations, and prayers for sending kids to school, finding lost objects, and safe travels. Much more too. Check it out on Amazon – this makes a great bat mitzvah or graduation gift; hostess gift, even wedding gift. And if you do get it, leave me a review on Amazon please! Thank you so much! If you want a signed copy, paypal me $25 and I’ll send it to you or someone you designate. (Just log in to your paypal account, click “send money” and fill in my email – ruchi@jewishfamilyexperience.org.) Or if you live in Cleveland, come to my book signing on February 7th at 11:30 am at the Laurel School in Shaker Heights. There’s nothing more amazing than hearing that this book has made a difference in people’s prayers. It’s truly the best feeling ever. Ruchi, Mazal tov, I'm so excited for you. Can't wait to read it! Mazal tov! What an accomplishment! I must note that when I followed the link to Amazon, it told me that other customers who viewed Ruchi's book also viewed size "HUGE"
I just received my copy from Amazon yesterday. I'm excited to have an accessible, personal siddur. I haven't had a chance to read much yet, but so far I am enjoying your modern interpretations, and the book is nicely organized and designed. I'm looking forward to really getting into it. Mazel tov on its publication!